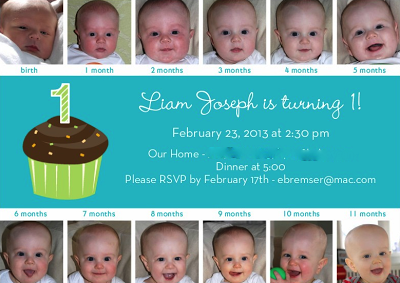 I created Liam's 1st birthday invitations on Shutterfly this past week. I found a template that let me use all of the "month" photos I've been taking of him. It's pretty amazing to see how much he's grown over the past year! 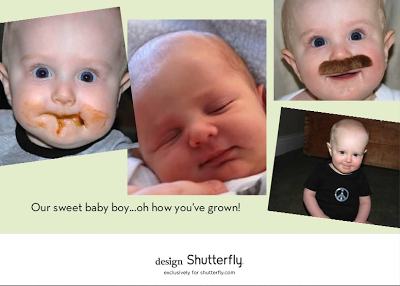 And I was able to put some of our favorite random photos of him on the backside. Here they are, ready to be mailed out to family. Hopefully a lot of our family members can make it to his party. It's going to be an exciting one for Liam! happy birthday coming up to Liam! 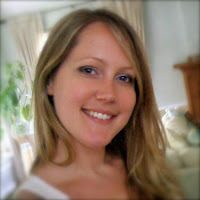 I love love love your pictures each month idea!